Would you like to join a very dedicated group of volunteers who desire to restore and maintain three of Cape Cod’s finest lighthouses? We need volunteers to help us with the ongoing restoration and upkeep of Race Point, Wood End and Long Point lighthouses. We have much in the way of maintenance projects going on throughout the year, with most of our larger projects accomplished during March and April. Whether your expertise lies in using a paintbrush, hammer and nails, or a broom and duster, we would welcome your efforts in helping us restore and maintain these historic sites! Or perhaps you would like to conduct lighthouse tours during the summer, where you can meet people from around the globe and share the history of Race Point Lighthouse with them. Do you have some spare time on Saturdays in the summer? We staff the tower on the first and third Saturdays of each month, May-October. We also host a special site tour on Mariner's Day in May, where visitors can enjoy tours of the tower, the Keeper's House and the Whistle House. Mariner's Day is an extremely successful event, and you can never have enough "hands on deck"! 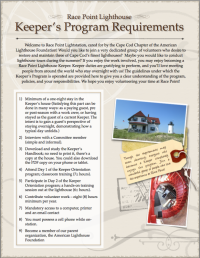 If you enjoy the work involved, you may be interested in becoming a Race Point Lighthouse Keeper. Keeper duties are gratifying to perform, and you’ll love meeting people from around the world who stay overnight with us... Spend a few moments reading our Guest Log at the house and you’ll see why! To learn more about becoming a Keeper, please download and read our Keeper's Program Requirements (PDF), to see the necessary requirements. If you feel you meet these requirements, please fill out our Volunteer Data Form, indicating that you want apply for the Keeper's positions, and submit it to the address listed on the form.